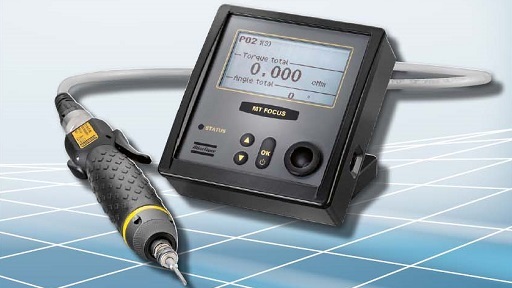 MT Focus 400 is a hand-held, electrically-driven monitored mounting system for small and very small torque. Control methods are the torque and the angle of rotation control. The process monitoring during the tightening of the screw takes place via torque and angle of rotation. There are eleven Digitork screw spindles with a maximum speed of 1000 rpm, as well as torque ranges between 0.5-27 Ncm with lever starter and between 80-250 Ncm with lever starter and push rod. Three sets of parameters can be used via six screw connections. The control and monitoring of the screw connection is realized by means of torque, angle of rotation and switch-off time. The target group is, for example, the electrical and electronic assembly for smartphones, hard disks, infotainment systems, navigation devices and medical technology. Depending on the control method, the IO / NIO monitoring checks the torque or angle of rotation at the end of the screw tightening and outputs the results acoustically and on display. Several screw connections on a workpiece can be grouped. A group monitoring makes sure, that not only the single screw connection but all the screw connections of a workpiece are IO. If necessary, a temporary locking of the tool for the post-processing of the screwing operation is carried out. The system can be set up directly on the PC via the USB interface and the ToolsTalk MT software. Optionally, the software packages ToolsTalk MT Analysis support the real-time analysis and ToolsTalk MT Net the data acquisition. An RS232 interface and binary I/Os are also available. The control of a vacuum pump is possible via its own output.